Last Saturday evening saw the auspicious beginning of the Met's first complete Ring cycle in the Robert Lepage production. On every level (except that of the production) I was enormously impressed. Revisiting the production, I did feel that my initial Ring-optimism had not been entirely unwarranted: this Rheingold, complete with functional rainbow bridge, does contain some powerful theatrical images, and uses space in ways which can at least be overanalyzed as alluding to the complex and precarious networks of power within the work. But it remains, in the end, primarily a backdrop for the performers. It was hard to believe that Fabio Luisi was conducting his third opera in the space of twenty-four hours: he led the orchestra energetically, and shed light on the details in the score's dense textures. I especially appreciated an "Entrance of the gods" which eschewed bombast. An excellent cast of singers gave committed performances. Wendy Bryn Harmer's soprano appears to go from strength to strength; she made a Freia both passionate and dignified. Franz-Joseph Selig brought out Fasolt's pathos, and Hans-Peter König made an imposing Fafner. Stephanie Blythe was in good voice and high dudgeon as Fricka, indignant at the choices Wotan has made, and saddened by their consequences. The Loge of Stefan Margita was a highlight of the evening; he sang with bright, unforced sound, and slyly nuanced attention to text. Eric Owens' charismatic and rich-voiced Alberich was, fittingly, a focal point of the evening. Bryn Terfel, as the king of the gods whose vision is tragically more limited than his ambition, sang with strength and subtlety, sounding more comfortable than when I last heard him in the opera. 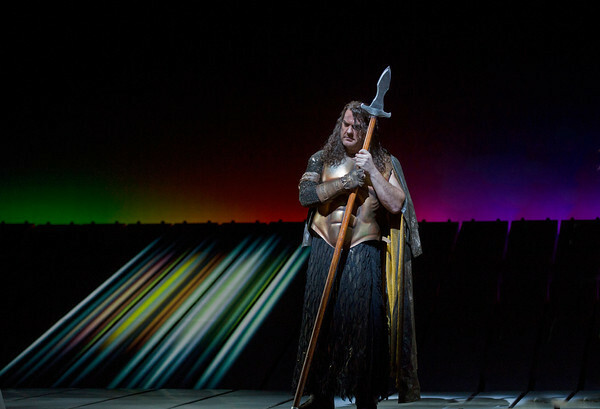 The intensity of both performances, Owens and Terfel boasting equal dynamism and strongly contrasting timbres, made clear the tensions which mean that the gods' possession of Valhalla is at best a tenuous triumph. Did they back off on the wire walking? Nope! Wire-walking occurred, both in journeys to/from Nibelheim and in entrance to Valhalla. Freia's tobogganing entrance was, fortunately, scrapped. Rheingold is the only one of the Cycle I haven't seen. I'm waiting for either the rebroadcast (provided Berlin decides to participate; oh please I've been ever so good) or the DVD. I'm one of the light-brained Wagner fans who goes into full squee-mode over some of this production's shenanigans, so I'll be getting the dvd set when it comes. Lucky you got to see it live!! !